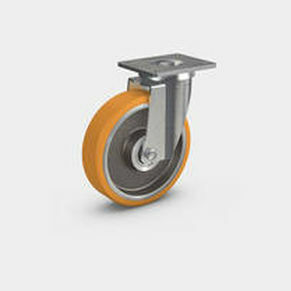 Wheels series 178 PUR with ball bearings (/5). Housings in precise highly stable welded steel construction. Swivel head with a high quality thrust ball bearing and a tapered roller bearing for the guidance of the kingpin. All bearing parts dust and splash proof. ALLSTOP total locking device on the non-trailing side of the housing, blocks rolling and swivel motion simultaneously.